Want to know something that’s always fascinated us? The second-tier sports games. Every console has its blockbusters like FIFA and NBA, but what about those sports that aren’t necessarily household names? We’re talking about rugby, cricket, and, yes, volleyball. 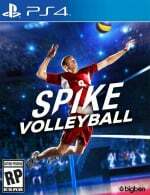 Well here’s an interesting new release: Spike Volleyball for the PlayStation 4. There have been volleyball games on PlayStation before, but they’ve historically included the Dead or Alive cast. This is more of a simulation of the sport, with 50 national teams and a campaign. The production values are very poor, but we’ve been playing this one for review and the gameplay loop isn’t awful. Check back for our verdict. I love nothing more than volleyball in life. I've been waiting for a decent vball game for quite a while now and since there aren't any great ones, I may get this one. Will wait for the review, though. @naruball Yeahhh, the problem is the price. It's £49.99 in the UK, which is absurd for what it is. Wait for the review. @get2sammyb I know that the stupid price won't help sales, but I can always wait. Price is, thus, never an issue for me. i saw this was £50 on the store and thought it was ridiculously priced. it's the same people that make/publish the handball game. i bought that for £7 in a sale and even that was too much to be honest, really low budget production values and not particularly smooth gameplay. I appreciate they don't have the budget of FIFA or MLB, but would rather they continue to improve on handball, as it's a great sport, rather than do half-assed versions of even more niche sports. No women in bikinis and they charge $50? Will sell about as well as that handball game that came out. I remember loving Beach Spikers by Sega! I do wonder what the sales figures look for games like this one and the handball games. I did like summer heat beach volleyball on PS2.